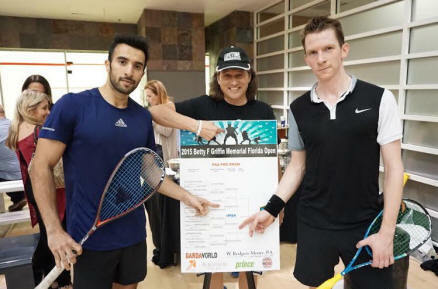 Qualifer Vikram Malhotra won his first and biggest title of his career by beating #3 seed Arthur Gaskin in the Betty Griffin Memorial Florida Open on the last event of the Life Time Grand Prix Tour. He played a close to perfect game by winning 11/6, 11/8, 11/7 in 45 min and showed no sign of fatigue from yesterdays monster 5 match game against Farhan Zaman. He said he had a great week and thanked everyone for supporting him through the qualifying and main draw matches which kept him focused. He is looking forward to coming back next year and defending his title. Despite Malhotra's much lower ranking, this is a player that is ready to compete with others in the top 100. 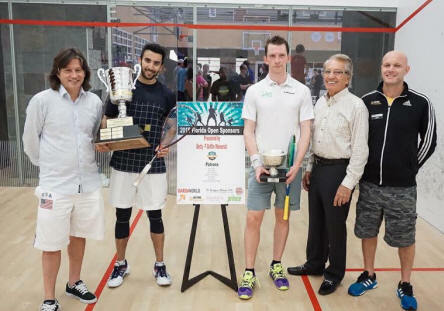 The tremendous show of respect and sportsmanship from both players was bested only by their supreme touch with drop shots on both left and right sides that were consistently tight and often teetering around the nick. The excellent performance from Stafford throughout the tournament wasn't to continue alas. "I had a great time and I'm really happy with my performance" said the Caymanian. Arthur Gaskin added: "I had to be on my best game tonight Cameron was playing so well this week"